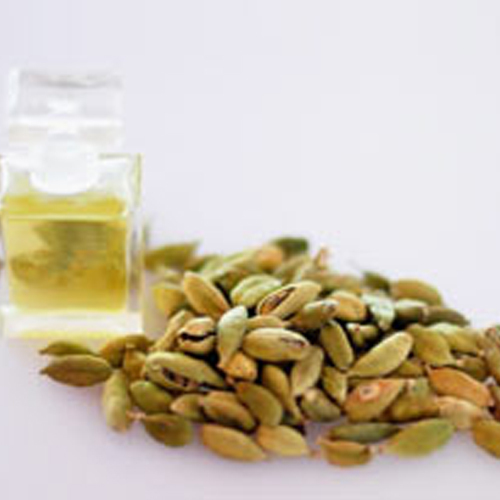 Cardamom oil is extracted using steam distillation method. For this, seeds of the fruit are used just before they ripe. The yielding through this process is normally 1 to 5 per cent. Cardamom oil contains sabinene, myrcene, a-pinene, b-pinene, a-phellandrene, limonene, p-cymene, terpinolene, 1,8-cineole, y-terpinene, linalool, linalyl acetate, a-terpineol acetate, citronellol, nerol, terpinen-4-oil, a-terpineol, geraniol, methyl eugenol and trans-nerolidol. A perennial, reed-like herb, cardamom grows up to 4 meters and has long, silk blade-shaped leaves. It has small yellowish flowers with purple tips and red brown seeds. This herb is native to tropical Asia and cultivated extensively in India, Sri Lanka, Laos, Guatemala and El Salvador. Seeds of the dried ripe fruit is used to extract cardamom oil. Cardamom oil is known for its vast usage as antiseptic, carminative, cephalic, digestive, antispasmodic, aphrodisiac, diuretic, sialagogue, stimulant, stomachic and tonic (nerve). Cardamom oil has a vast range of usage for treatment of sciatica, coughs, abdominal pains, spasm and nervous disorders. Traditionally, it is used for pulmonary disease, fever, digestive and urinary complaints in India and China for over 3000 years. It is also used to flavour pharmaceutical products. Apart from pharmaceutical usage, cardamom oil is also used as a fragrant in soaps, perfumes and cosmetic products. It has a warm romantic & aphrodisiac aroma and is used in massage oil to ease coughs, muscle spasms as well as to reduce swelling and irritation from inflammation. This essential oil can also be used to improve the concentration by means of reducing drowsiness and irritability. Cardamom oil blends well with other essential oils. Those include bergamot, cinnamon, rose, olibanum, orange, clove, caraway, cedarwood, neroli (orange blossom), ylang ylang, labdanum and oriental bases in general. Cardamom essential oil is non-toxic in nature and is also known for non-irritant and non-sensitizing properties. Cardamom essential oil is highly beneficial to the digestive system and is ideal for treatment of coughs and other indications.